Discover something new in your community! If you were at our Stampede Breakfast, you might have seen a tent set up with a physical map of Crescent Heights. We asked residents to identify community assets, such as non-profits/service organizations, businesses, green spaces/recreation, and dining spots in the neighbourhood. However, part of what makes a community unique is its intangible culture and history, which is what this map seeks to capture. Besides listing the buildings and spaces that can normally be found on Google Maps, I have been working with residents to identify “Secret Spots” – lesser-known locations in the community that only the local residents might be aware of. These include the Little Free Libraries scattered across the neighbourhood, staircases, public art, and other hidden gems. A special thank you to Wendy for taking me on walks around the community – it’s through exploring many of the alleyways and going off the beaten path that I was able to discover the wonderful and unique peculiarities that make this neighbourhood what it is. I have also been working closely with Alan, a resident historian to gradually add Historical Sites and Buildings onto the map. Crescent Heights is a community with rich history and this is a way to preserve it. For example, a Crescent Heights Public Library, a Calgary Municipal Railway streetcar, and a fire hall all once existed in the community, but they are now the sites of parking lots or dental offices. Check out photos and stories of these locations on the map! A special thank you to Alan for his continued work and passion in preserving the city’s cultural heritage – he has been writing for the CHCA newsletter for the past 10 years and sharing many stories of important individuals, locations and events in this neighbourhood. 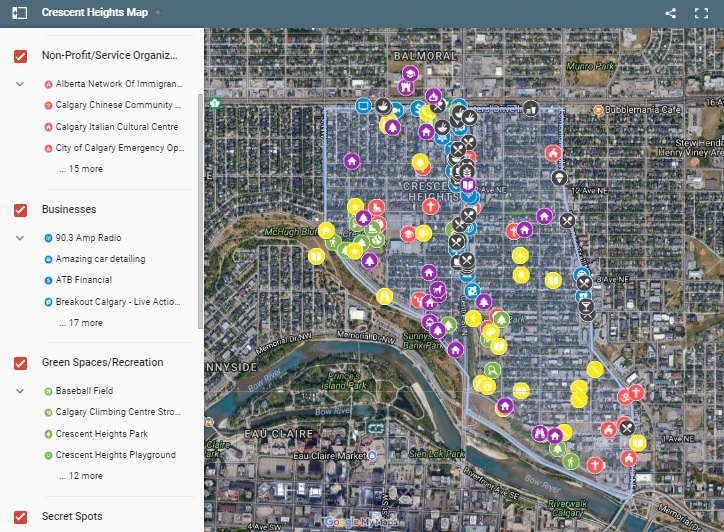 Whether you are a recent or long-term resident, I feel there is something new for you to discover about Crescent Heights on this map. My role in this project is creating the framework for this map to exist, but I view the map as the collective property of all the Crescent Heights residents. From now on, it is out of my hands because I want residents to participate and take ownership of the map themselves. There is still a lot to capture in the community! The map is now online and available for you to view on this website under the “Interactive Crescent Heights Map” tab. There is also a form on that same page for you to provide suggestions of items to add or change on the map.